When season 4 of Arrow started, the show found Oliver Queen (Stephen Amell) living a quiet suburban life with his girlfriend Felicity Smoak (Emily Bett Rickards) far away from Star City. 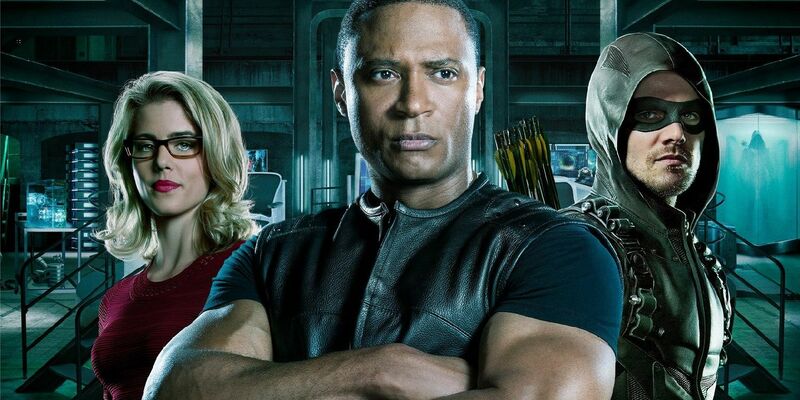 Meanwhile, the remnants of Team Arrow - John Diggle (David Ramsay), Thea Queen (Willa Holland), and Laurel Lance (Katie Cassidy) - continued to fight against the criminals on their home turf. However, when Damien Darhk (Neal McDonough) arrived on the scene, Oliver and Felicity returned to Star City, and much of season 4 has focused on the superhero team attempting to thwart the villain's plan to destroy the world and start anew. When the season 4 finale episode, 'Schism,' begins, Darhk's plan has changed to completely wipe out the world as a "mercy killing" on a global scale. The episode features a final showdown between Oliver and Darhk that causes a schism within the hero, even while he's offered a new opportunity. The aftermath of their battle against Darhk's apocalyptic plan leaves the future of the Green Arrow team in question. Plus, the season-long arc of flashbacks concerning Oliver's time on Lian Yu comes to a close, and teases a new story to unfold in season 5. Now, if you're left with more questions than answers by 'Schism,' we break down the Arrow season 4 finale and what it means for season 5. After Oliver returned to the fold of superheroism and donned the new persona of the Green Arrow earlier in season 4, he also tried his hand at running for mayor of Star City. However, when Darhk captured Oliver's son, he conceded his campaign to Darhk's wife Ruvé Adams (Janet Kidder), who then became mayor. In the aftermath of 'Lost in the Flood' and Ruvé's death within the rubble of Genesis, though, Star City is left without a mayor. Considering Oliver's rallying speech of hope that stems the anarchy running rampant in the city during 'Schism,' he is called upon to fill in as interim mayor and is sworn in at the end of the episode. However, with the Team Arrow lair still a wreck in the wake of the Ghosts' attack, it seems Oliver has hung up his bow and cowl for now. Of course, there is precedent for Oliver's time as mayor from the DC Comics. In 2006, the Green Arrow title jumped forward a year in time following the events of Infinite Crisis, finding Oliver with a newly acquired personal fortune and a position as the elected mayor of Star City. Though Oliver's tenure as mayor came to an end later on in the series - when he was forced to resign after unknowingly funding a rogue group called the Outsiders - it certainly seems Arrow is drawing on this particular story arc for the end of season 4 and leading into season 5. But, though Oliver continued to don his cowl and take up his bow within the arc of the comics, it remains to be seen if the Green Arrow will continue his nighttime antics when season 5 begins. Certainly, with John, Thea, and Quentin Lance (Paul Blackthorne) stepping back from the team or leaving Star City entirely (and Laurel having passed earlier in the season), only Oliver and Felicity remain as the remnants of Team Arrow - not that Oliver is a stranger to working alone. That said, since season 5 of Arrow will deal less with superpowers, the show could focus on Oliver balancing his new role as mayor with his work as the Green Arrow when the next season begins. Amell previously teased that the season 4 finale "feels very similar because it's almost the opposite" of the season 3 finale, which saw Oliver and Felicity leaving while the remaining team members stayed. True to his word, 'Schism' ends with Oliver and Felicity staying on Team Arrow while the remaining survivors of the team take time away. In Lance's case, he is left without a job on the police force, and leaves town with Donna Smoak (Charlotte Ross). Meanwhile, John is still dealing with killing his brother and decides to leave Star City, and his family, for a time. Thea, however, realizes she's her father's daughter and, in an effort to honor Laurel's memory, decides to leave the superhero antics behind, as she explains, "before I lost too much of myself." For John and Thea in particular, the characters do seem to have reversed their roles in the dynamic of the show - John becoming the person Oliver needs to reign in rather than the one doing the reigning, while Thea started out dealing with her increasing bloodlust and is now stepping way from violence entirely. But Oliver worries that it was his own darkness that rubbed off on his family and friends. As for where Oliver falls in terms of his personal darkness in the finale, he was able to overpower Darhk despite the villain's unrivaled strength gained by the deaths of tens of thousands of people in 'Lost in the Flood' because Oliver had the hope and support of Star City behind him. However, the contrast between Oliver's darkness and the lightness and hope he's discovered throughout season 4 have caused an internal struggle - as Felicity explains: "What you're feeling is a schism." The schism seems to be exacerbated by Oliver's choice to kill Darhk, rather than spare the villain's life as he did with Deathstroke. Oliver killing Darhk is a big moment of change for the character, who had for some time refused to take any lives as part of his own moral code. This schism, this personal rift within Oliver, will impact the character moving into season 5 as he deals with his choice to end Darhk's life as a means of vengeance and justice. The flashback storyline of season 4 comes to an end with Oliver killing Taiana (Elysia Rotaru) in order to save her from the idol's power. Amanda Waller (Cynthia Addai-Robinson) arrives with a team of ARGUS agents to confiscate the idol and take it to The Slab - a reference to the Slabside Penitentiary in the comics - where it would eventually fall into the hands of Darhk. Waller returns Oliver's belongings to him and invites him to continue working with ARGUS, but he mentions that he has "a promise to keep." It seems Oliver is headed to Russia, likely to save Taiana's home from the force that had overtaken it. While under the idol's power, she makes mention of rescuing her home, so it seems he'll be picking up her mission. So, Russia appears to be the last chapter in the five-year story of the flashbacks, additionally explaining Oliver's ties to the Russian mob that were included in the show during its first season. So, with Oliver heading to Russia in the flashbacks, season 5 will also pick up with him as mayor of Star City in the present day. Additionally, Team Arrow seems to be disbanded for the most part, with the members scattered and dealing with their own emotional consequences of their battle against Darhk. Still, it seems likely Oliver will continue to fight against evil in his city both through his new role as the mayor and as the Green Arrow - though perhaps only with Felicity as back up. Furthermore, season 5 will introduce a new big bad, one that wasn't teased in the season 4 finale. Though we may have some idea what to expect from the new foe for Oliver given the casting notice that potentially offered details about the season 5 villain, the identity of the character has yet to be officially announced. However, Amell recently teased that, unlike Darhk, the season 5 villain won't have superpowers. So, perhaps Arrow season 5 will be somewhat of a return to a world without mystical idols and metahumans running around, but we'll have to wait and see. Arrow will return Wednesdays on The CW in Fall 2016.